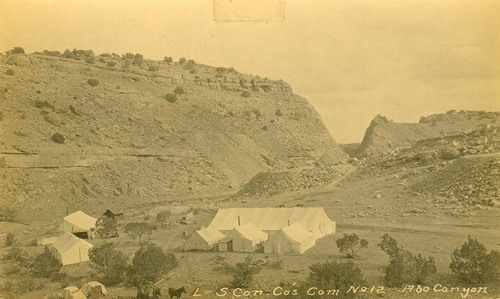 View of Lantry-Sharp Construction Company's camp No. 12 in Abo Canyon, New Mexico. Construction of the AT&SF Railway bridges, tunnels, and tracks in Abo Canyon was begun in 1905 and completed in 1908. The Lantry-Sharp Construction Company was a contractor on the project. Lantry-Sharp Construction Company, Abo Canyon, New Mexico.